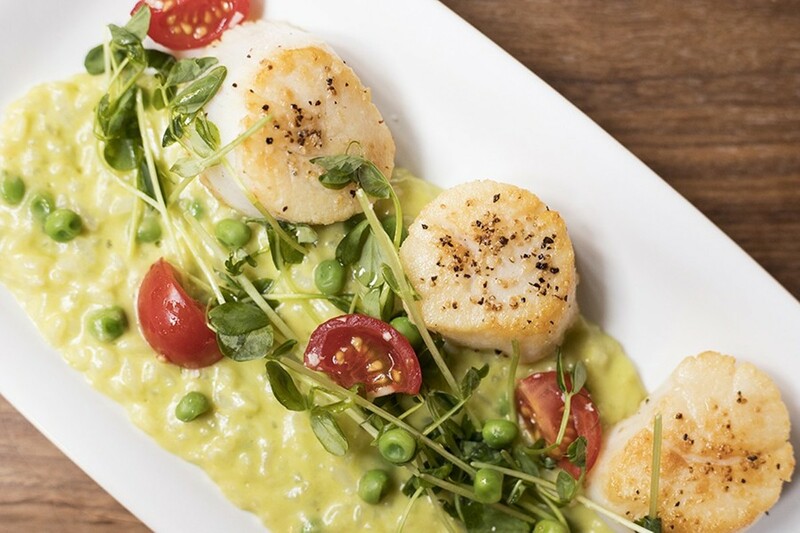 Sea scallops are served with pea risotto, tomatoes, pea shoots, mint and olive oil. 100 W. Lockwood Avenue, Webster Groves; 314-942-1216; Mon.-Tues. 7 a.m.-2 p.m.; Wed.-Fri. 7 a.m.-2 p.m. and 4-9 p.m.; Sat.-Sun. 7 a.m.-3 p.m. and 4-9 p.m.
Several months ago, my husband and I were out and about, looking for a dinner spot to celebrate our anniversary. We wanted something low-key but nice — a place where we could get a good burger and an even better bottle of wine — and Olive + Oak ticked those boxes. We weren't fools, though. The chances of getting a table in the dining room were nonexistent; the place books up months in advance. Instead, we asked for a seat at the bar, which, to our dismay, was not only completely full but on a wait. A two-and-a-half-hour wait. It was 6 p.m. on a Wednesday. No one begrudges owners Greg Ortyl and Mark Hinkle for Olive + Oak's success. In fact, the personal hell they've been through — the loss of their sons to congenital heart defects is how they got to know each other in the first place — makes you root for them more than just about any other restaurateurs in town. Considering that Olive + Oak is a living memorial to their boys, it's fitting that the restaurant has shot to the top of the city's restaurant scene like a rocket that refuses to come back down to earth, even two years into its run. 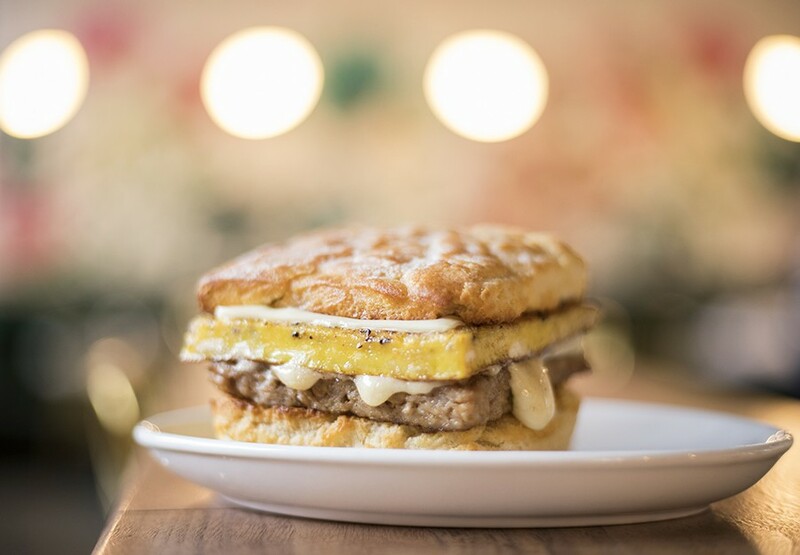 The "Biscuit Sand" is topped with white American cheese, egg and breakfast sausage. It's also not their fault that the restaurant is so damn popular. 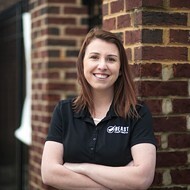 Hinkle and chef Jesse Mendica spent a good deal of their restaurant careers at the esteemed Annie Gunn's as general manager and chef de cuisine, respectively; they were seemingly destined to open a place where everyone wanted to eat. However, it's possible that the restaurant is a bit too successful. The wait times and impossible reservations are so legendary, they are the first things people mention when they speak about the restaurant, often with an eye roll. It's like the cool kids in high school: popular, but resented for that popularity all the same. Hinkle and company are keenly aware of this, which is why they knew they had to figure out a way to serve more guests, lest they run the risk of having mobs rush Olive + Oak's doors (which really isn't that far removed from current reality) or alienate would-be diners with the lack of available reservations. When news hit that the neighboring Webster Bookshop was closing its doors after 50 years, Hinkle jumped on the space, seeing it as the answer to the restaurant's lack of capacity. However, he smartly did not use it to expand Olive + Oak, which had already maxed out its operation. Instead, he opted for a different format — one that would allow would-be diners to simply walk in. If reservations were the problem with Olive + Oak, the new place would solve that by eschewing reservations altogether. A vibrant floral mural beckons from the back wall, while green velvet banquettes line the walls. The resulting restaurant, the Clover and the Bee, opened this past December on the corner of West Lockwood and Gore, adjacent to Olive + Oak. The concepts share not just a hallway (though you can't see that from the dining room) but also a cohesive chic aesthetic of blonde wood and tufted banquettes. However, the Clover and the Bee feels much more whimsical, adorned as it is in jewel-colored velvet and brass and outfitted with earthy succulents. Its design centerpiece is a bright floral mural, which takes up the entire back wall space. If Anthropologie had a cafe inside its stores, it would look a lot like the Clover and the Bee. 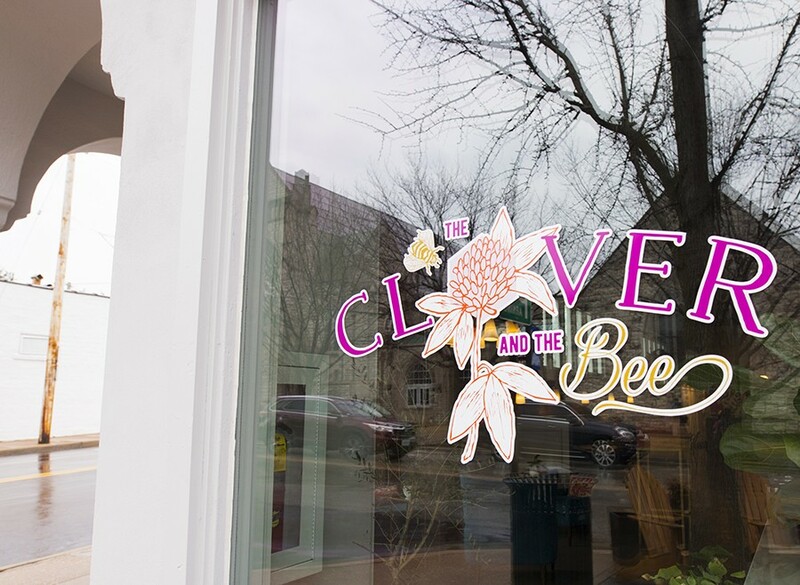 Originally, the Clover and the Bee was envisioned as a breakfast-and-lunch, fast-casual concept, but, go figure, the restaurant was so jam-packed that counter service became a logistical nightmare. 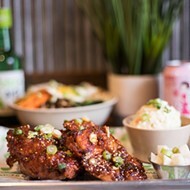 Now it's full service, a format that seems more appropriate for the thoughtful fare on offer, which does not deviate that far from its sister restaurant's elevated yet approachable playbook. 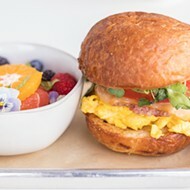 Chef Mendica translates her cooking to the daytime with dishes like the impeccable "Biscuit Sand," a mammoth breakfast sandwich that layers a large rectangle of fennel-kissed pork sausage and an equal-sized slice of egg (akin to a frittata) with white American cheese on a buttery biscuit that tastes like flaky shortbread. Two people could share this breakfast masterpiece and be satisfied. Splitting the sandwich means you'll have more room for the terrific breakfast potatoes. Chimichurri dresses these roasted beauties, giving them a punch of garlicky tang that brightens their salty flesh. 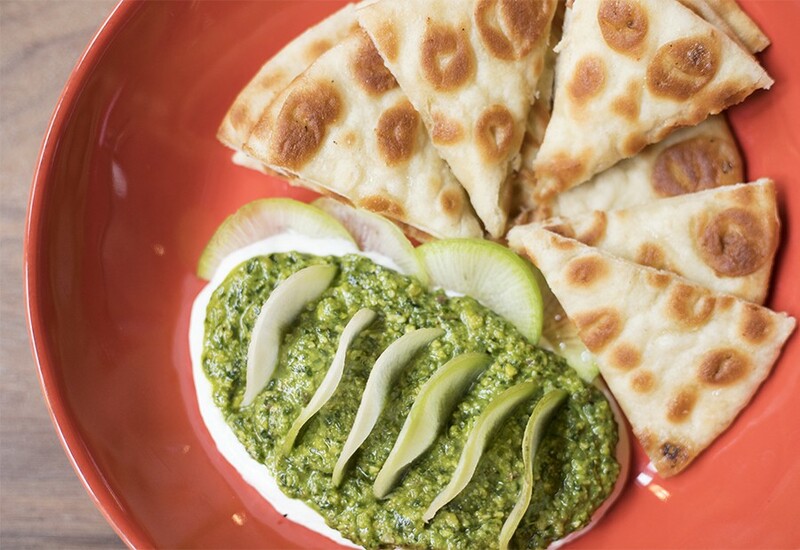 The pistachio dip is served atop goat cheese with toasted pita and radishes. Lunch is no less thrilling. The pistachio dip features a tapenade of nuts and fresh herbs that garnishes velvety whipped goat cheese. Razor-thin sliced radishes punch through the cheese's richness. For a counter to this dish's decadence, a salad of shaved Brussels sprouts, apples, cherries and pecans is bright and crisp; an optional pancetta add-on contrasts the sweet overtones with the rich, salty pork. Sandwiches include a heap of luscious burrata, accented with pine nuts and broccoli pesto, that soaks into a crusty ciabatta roll. Its luxury is matched by a seemingly simple pastrami on rye that is anything but: Piles of the smoky cured meat are slick with rendered fat, which is made even more indulgent with the addition of fonduta, a molten Italian cheese. The fonduta and drippings from the pastrami form an unctuous glaze that seeps into every crevice of the rustic rye bread. Its caraway-seed crust and some yellow mustard cut through the fat like a smack across the face. Both the pastrami and burrata sandwiches are simple enough, but their flawless execution and thoughtful details elevate them beyond casual cafe fare. 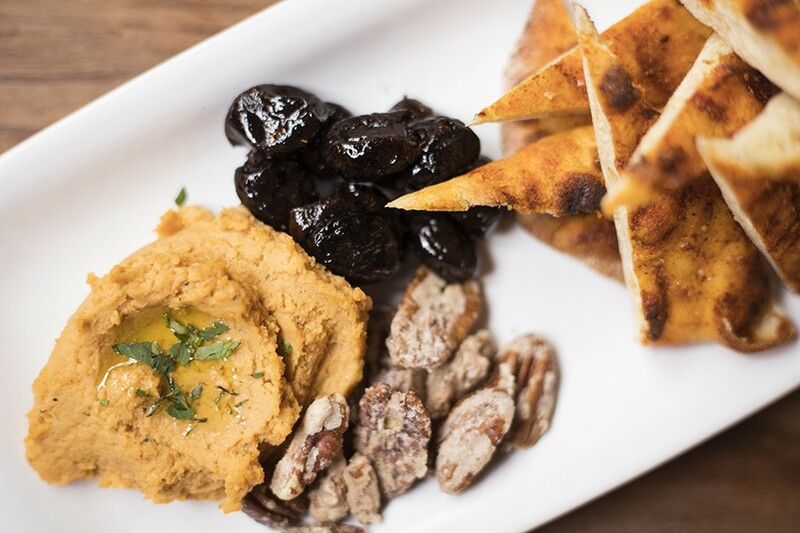 The spiced flatbread combines olives, candied pecans, honey, spicy hummus and preserved lemon. The Clover and the Bee added dinner service in January, right around the time it changed to a full-service format, because — shocking to no one — demand necessitated an additional seating. 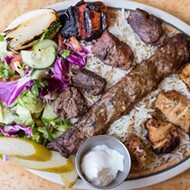 There is a good deal of crossover between the dinner and lunch menus (sandwiches, soups, salads, some appetizers) with a few nighttime additions. A succulent roast half-chicken tastes like Thanksgiving in Provence with its herbed stuffing and tarragon gravy. I would have liked the skin to be crisper, but it was otherwise a solid offering. Mendica's white-cheddar grits are deservedly becoming one of the Clover and the Bee's signature dishes. At dinnertime, she pairs the creamy cornmeal concoction with shrimp that is grilled so that its skin picks up just a whisper of bitter char. A sweet-and-chunky tomato ragout complements the briny shellfish and softens the smoky char for a delightful contrast. A full coffee program is available. 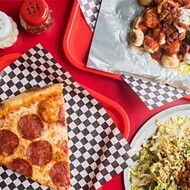 A carryover from its brief life as a fast-casual concept, the Clover and the Bee has a large pastry case filled with everything from breakfast treats to full-on desserts. 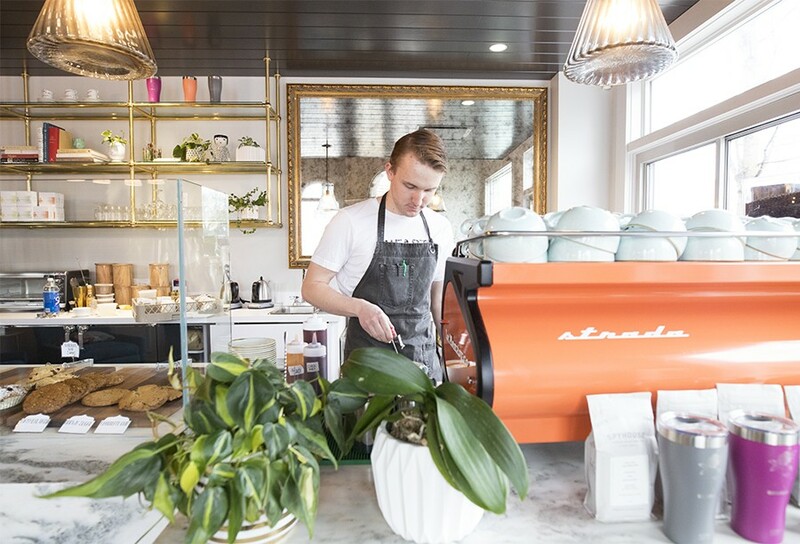 Though your server will bring you a menu with a handful of the offerings, you're better off getting out of your seat and taking a gander at the display of croissants, muffins, buttercream-covered cupcakes, bread pudding and cookies — the brown-sugar cookie is particularly noteworthy for its deep, molasses flavor. In addition to being a vibrant visual aid, the pastry case serves another important end: It can provide you with a quick snack if you grow faint waiting for your table. And there will be a wait, especially at breakfast and lunch time during the weekends, though the restaurant uses the NoWait reservation app which is an absolute godsend. Ninety minutes for the next table? It's much less of an annoyance when you can determine that from the comfort of your own home and plan accordingly. 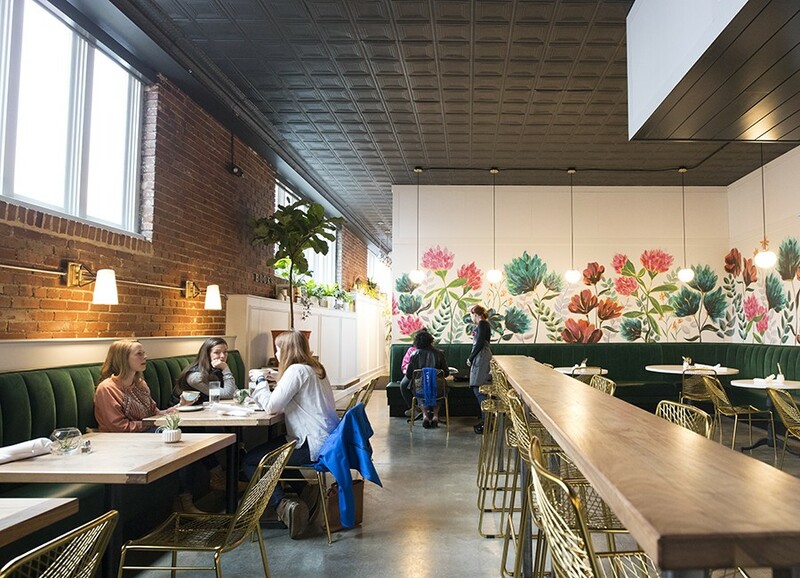 But just the fact that you can get into the Clover and the Bee within 90 minutes of deciding it's where you want to eat is a small miracle — one that Hinkle and company should be commended for facilitating with the restaurant's format and reservations policy. At this rate, he and Ortyl will have to hope that the entire block becomes available to lease. No matter how much they keep giving us, we can't help but want more.